Friday’s market session was about one thing: will Deutsche Bank stock close the week ahead of a three day holiday at a record low. It did not because, as we reported, the AFP announced that based on “sources” (most likely from Twitter), the DOJ was willing to reduce the $14 billion settlement that sent DB stock on a rollercoaster ride over the past two weeks, to just under $6 billion. The news unleashed a massive short squeeze relief rally, which sent DB stock soaring on Friday, pushing the entire market up 1%. And while repeated attempts by the likes of Reuters to get additional information from either the DOJ, the German government or Deutsche Bank itself, have proven fruitless, overnight Frankfurter Allegemeine Zeitung reported that Deutsche Bank executives are heading to the United States in the coming days to negotiate the $14 billion settlement over a fine the infamous $14 billion for misselling RMBS. The FAZ did not cite any sources for its report. Deutsche Bank did not immediately respond to a request for comment on Chief Executive John Cryan’s travel plans. In other words, not only was the $5.6 billion “agreed upon” number, as “reported” by Twitter and then AFP, bogus, but the actual negotiations have not yet even begun. 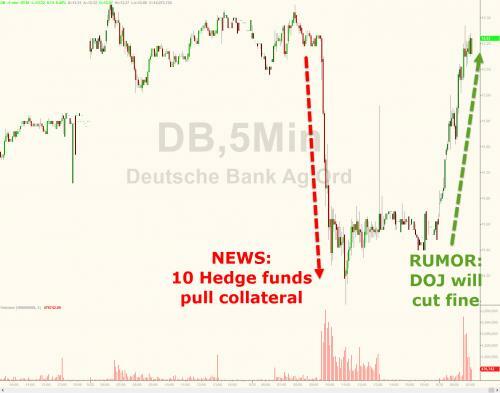 It also means that the catalyst for Friday’s ramp was, as we suspected, nothing but the latest attempt at media manipulation meant to push DB stock higher and prevent a concerned German population from pulling its cash out of the bank, of which DB has well over €300 billion in retail deposits. With Germany closed on Monday and only the far more illiquid US DB stock trading on Monday, we look forward to the market’s reaction to the realization that what it soared on what was nothing more than a media stunt, especially in the aftermath of Saturday’s announcement that Italy is the latest sovereign to take Deutsche Bank to task for its allegedly illegal manipulation and misrepresentation of Monte Paschi’s books.